Since the exhibitions on Chardin organised in conjunction with the bicentenary of his death and the tercentenary of his birth, in 1979 and 1999 respectively, there have been no further revisions of the relatively small oeuvre (around 200 works) of this admired and highly original artist. 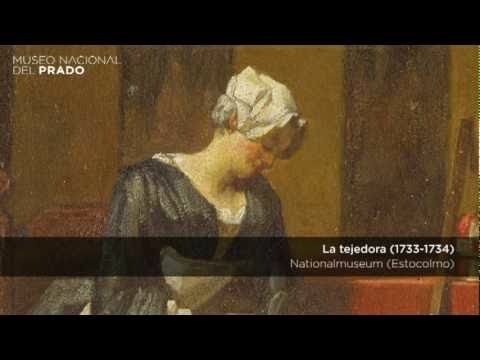 Featuring 57 paintings, the present exhibition offers a rare opportunity to appreciate Chardin’s work and is the first on the artist to be held in Spain. The exhibition is structured chronologically, covering the most important phases of the artist’s career from his beginnings in the second decade of the 18th century to his late pastels of the 1770s. Visitors will encounter some of Chardin’s most celebrated paintings, shown alongside other, little known canvases loaned from private collections, and some recently identified compositions. In addition, the version to be shown in the Prado includes 16 works not exhibited in Italy. 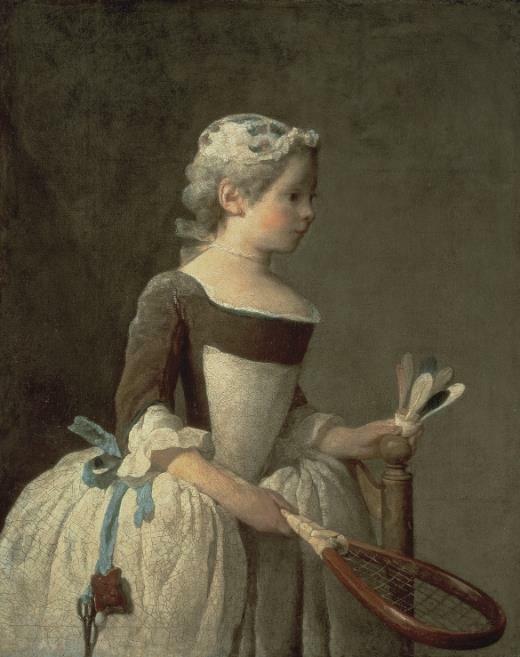 They include The Ray, one of Chardin’s most important paintings, loaned from the Musée du Louvre; The Attributes of the Arts, from the Musée Jacquemart-André in Paris, which is a large-format composition on an allegorical theme that has never previously been loaned to an exhibition; and the three versions of The young School Teacher (National Gallery, London, National Gallery of Art, Washington, and National Gallery of Ireland, Dublin), now shown together for the first time in Madrid.The generous collaboration of a remarkable number of leading American and European institutions - particularly the Musée du Louvre, which has lent 11 works - as well as that of private collectors has made it possible to realise the challenging aim of bringing together some of Chardin’s most celebrated paintings for the present exhibition. Basket of wild strawberries (c. 1760). Oil on canvas, 38 x 46 cm. Private collection. The exhibition opens with still lifes from the second half of the 1720s, including the celebrated painting The Ray, on loan from the Louvre. It was Chardin’s entry piece into the Royal Academy of Painting and Sculpture in Paris but the artist was only admitted in the lesser category of “Painter of animals and fruit”. 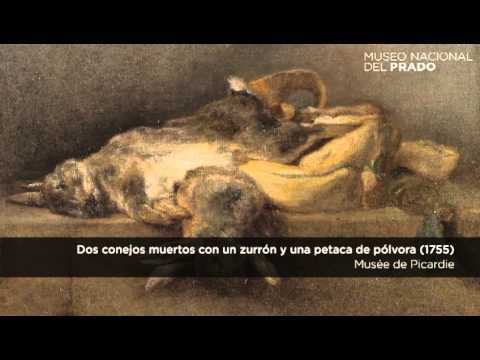 At this point he broadened his areas of interest and introduced the motif of live animals in his paintings, as can be seen in the two canvases from the Museo Thyssen on display in this section: Cat with a Piece of Salmon and Cat with a Rayfish. The next section opens with still lifes from the 1730s, including A green-necked Duck hanging on the Wall and a bitter Orange, and Still Life with a Porcelain Vessel and two Herrings suspended by pieces of Straw from a Nail in front of a Niche. Shown next, and also from this decade, are three examples from the celebrated Soap Bubbles series. 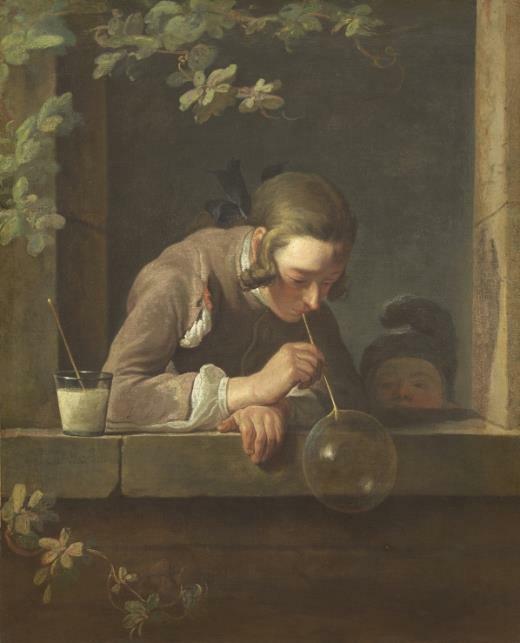 Chardin worked in a variety of genres, never completely abandoning one in order to take up another and was continually inventive within all of them. He would also frequently return to earlier themes and simultaneously work on different paintings at the same time. In the 1730s, and influenced by 17th-century Dutch painting, the artist turned his attention to genre scenes. Chardin masterfully conveyed the meditative mood of his figures and the serene dignity of simple domestic tasks, while his stylistic evolution is clearly evident in these works. His brushstroke becomes more vaporous and the soft tonality heralds the pastels of his final years. In addition, he abandoned his use of models from the humbler social classes to focus on the bourgeois circle of his second wife. It was works such as The young School Teacher, seen here in three versions that have been brought together for the first time, Boy with a Top, and Girl with a Shuttlecock, that would bring Chardin true popularity in the second half of the 19th century. The exhibition then turns to works from the 1750s and 1760s and to the artist’s return to the still life, a genre that he had almost completely abandoned. These compositions are clearly different to the works of the 1720s due to the presence of a greater variety and number of types of game, species of fruit and objects (costly pieces of porcelain and sophisticated glass ware). Among works from this period in the exhibition are the delightful Basket of wild Strawberries, Glass of Water and Coffee Pot, and Bouquet of Carnations, Tuberoses and Sweet Peas in a white porcelain Vase with a blue Pattern, the latter a masterpiece loaned by the National Gallery of Scotland. Works such of this type reveal a more agile, smoother type of brushstroke and also demonstrate the artist’s interest in painting reflections, transparent effects, light and shadow. The exhibition ends with two pastel portraits, the medium to which Chardin turned after he was obliged to abandon oil painting due to failing health and which provoked great surprise at the 1771 Salon. These pastels reveal Chardin’s confidence in his own powers and mark the end of his artistic career. 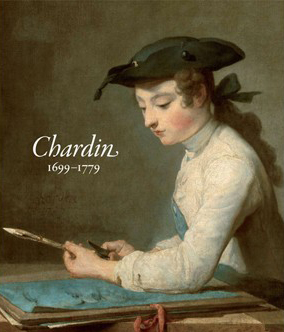 Chardin was born and died in Paris, spending all his life there and rarely leaving the city. Of humble social origins, he initially trained as a craftsman, a fact that influenced his painting and is evident in the combination of minute detail and freedom that characterises his works. Chardin painted slowly, in quest of perfection, and his output was relatively small as a result. He trained with the history painter Pierre-Jacques Cazes and with Nöel-Nicolas Coypel. In 1728 the Royal Academy of Painting and Sculpture acknowledged his talents and accepted him on the basis of The Ray and The Sideboard in the lesser category of painter “in the skill of animals and fruit”. Some years later Chardin started to produce “genre paintings”. These small-format works depicting scenes of everyday life made use of a bourgeois, moralistic viewpoint to offer a sociological study of the figures. Notable within this category are two works in the exhibition: The Blessing and The diligent Mother, both of which brought the artist enormous famous, partly through their reproduction in the form of prints by Charles-Nicholas Cochin the Elder (1688-1754) that circulated throughout Europe. Other examples of this type are the three versions of Soap Bubbles, loaned to the exhibition from US institutions. Chardin never abandoned one genre in order to take up another, but from the 1750s onwards he produced fewer genre scenes and turned back to the still lifes of his early career. Examples of these later still lifes include Basket of wild Strawberries, Glass of Water and Coffee Pot, and Bouquet of Carnations, Tuberoses and Sweet Peas in a white Porcelain Vase with a blue Pattern, all to be seen in the exhibition. Chardin’s final works are pastel portraits, of which two from a private collection are included in the exhibition. Chardin’s clients were Parisian aristocrats, connoisseurs and friends who were artists. In addition, his great princely and royal patrons included Louis XV of France, Catherine II of Russia and Louisa Ulrika of Prussia, Queen of Sweden. 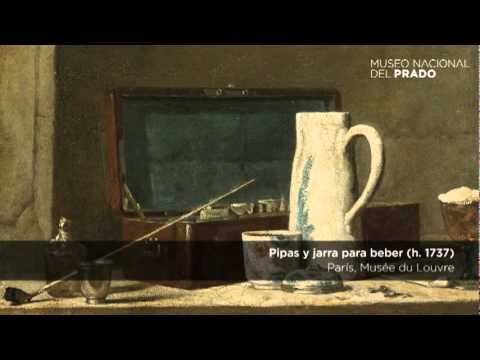 Jean Siméon Chardin, son of a skilled cabinetmaker, is born in Paris. The Royal Academy of Painting and Sculpture awards him a second-class medal for drawing. He continues his training at the Academy, a fact which contradicts the image of Chardin as a completely self-taught artist. He joins the Academy of Saint Luke as a master painter after a spell in the workshops of two history painters, Pierre-Jacques Cazes (1676-1754) and Noël-Nicolas Coypel (1690-1734). Chardin shows several paintings at the Exposition de la Jeunesse in the Place Dauphine in Paris, among them two ambitious works: The Skate (no. 1) and The Buffet. In September, at the age of twenty-nine, he is elected to the Royal Academy of Painting and Sculpture as a painter specialised in "animals and fruit". He marries Marguerite Saintard, daughter of a wealthy Paris merchant, to whom he had been engaged since 1723. Their eldest child Jean-Pierre Chardin, who was later to become a painter, is baptised in November. Chardin collaborates in restoring the frescoes of the gallery of François I at Fontainebleau, alongside Jean-Baptiste Van Loo (1684-1745). Likely date of his first paintings featuring human figures. His wife Marguerite Saintard dies, followed shortly afterwards, in 1736 or 1737, by his beloved daughter Marguerite-Agnès, born in 1733. He shows seven genre scenes, among them Girl with a Shuttlecock (no. 34), at the Salon of the Louvre. Although he regularly takes part in the Salon from this date, he often exhibits paintings executed several years earlier. Appearance of the first prints of Chardin’s paintings by Charles-Nicholas Cochin senior (1688-1754), his regular engraver: Young Soldier and Girl with Cherries. Between 1738 and 1775 forty-five of his works are published as prints, helping spread knowledge of his painting and bringing him a considerable income. In August he shows nine paintings at the Salon. The Superintendent of the Royal Buildings, Philibert Orry (1689-1747), presents Chardin to Louis XV. The artist gives the King The Diligent Mother and Grace before Meals (nos. 44 and 45). 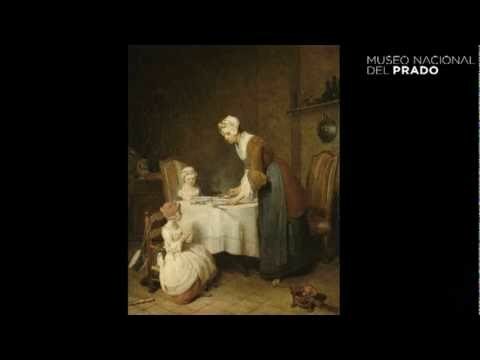 Chardin shows only two pictures at the Salon; one of them, Morning Toilette, belongs to Count Carl Gustav Tessin (1695-1770), the Swedish special ambassador in Paris. Mehemet Effendi, special ambassador of the Sultan, visits his studio. He marries 37-year-old Françoise-Marie Pouget, the widow of Charles de Malnoé, a former king’s musketeer. Through his second marriage the painter joins the circles of the Parisian bourgeoisie. He returns to still life, a genre he has hardly cultivated since 1733. During the following years he exhibits progressively fewer genre scenes and more still lifes at the Salon. The King grants him a pension of 500 livres. Chardin exhibits nine paintings in the Salon, among them Dead Hare with Shotgun, Game Bag and Powder Flask (no. 10). In March he is unanimously elected Treasurer of the Academy and in August he is appointed to direct the installation of the Salon, where he himself shows two works. 27 May: The King assigns him living quarters in the Louvre. His son Jean-Pierre Chardin receives his diploma granting him a scholarship at the French Academy in Rome. He takes part in the Salon showing nine paintings. This is the first Salon to be reviewed by the French philosopher and critic, Denis Diderot (1713-1784), who becomes one of the greatest enthusiasts of Chardin’s work. Louisa Ulrika, Queen of Sweden, sends him a medal in gratitude for the prints he has dedicated to her: Drawing Class and Good Education. Maurice-Quentin de La Tour (1704-1788) produces a pastel portrait of Chardin (Paris, Louvre) and exhibits it at the following year’s Salon. The Academy sends Chardin and the sculptor Guillaume Coustou to visit the sculptor Jean-Baptiste Pigalle, who is seriously ill. Pigalle himself was a great admirer of the painter and owned six works by him. English corsairs kidnap Jean-Pierre Chardin off the coast of Genoa when he was returning to France. At the recommendation of Charles-Nicholas Cochin junior (1715-1790), secretary of the Academy, Chardin is commissioned to execute three over-door paintings for Choisy castle: Attributes of the Arts, Attributes of Music and Attributes of the Sciences (the latter is lost). Catherine II of Russia (1729-1796) commissions an over-door painting, Attributes of the Arts, for the Saint Petersburg Academy of Fine Arts. His son Jean-Pierre Chardin arrives in Venice as part of the retinue of the ambassador of France to the Venetian Republic. Chardin surprises visitors to the Salon by showing his first pastels, three studies of heads including a Self-Portrait. He employs this new technique for reasons of health. His eyesight is affected by the pigments and binders used in oil paint. His son Jean-Pierre drowns in a canal in Venice. It appears to be suicide. His works have yet to be studied. Chardin resigns from the post of Treasurer of the Academy. He donates to the Academy his pastel portrait by La Tour. He participates in the Salon with three studies of heads in pastels, one of which is a Self-Portrait and the other the Portrait of Madame Chardin. Chardin and others are entrusted with the arrangement of the Academy’s library. Chardin takes part in his last Salon, showing several pastel head studies. Madame Victoire, Louis XV’s daughter, admires one of them and sends the artist a gold casket. Chardin dies at the age of 80 in his apartment in the Louvre on 6 December. Washington, National Gallery of Art. 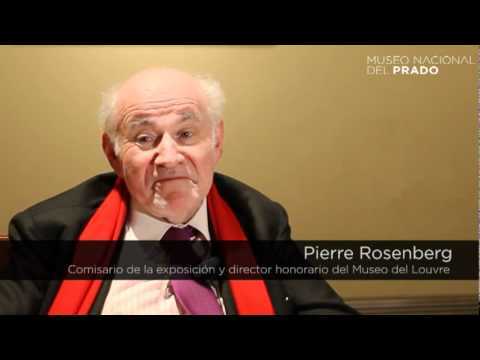 In the words of the exhibition’s curator, Pierre Rosenberg, Honorary Director of the Louvre and the leading expert on Chardin: “If I had to define his still lifes in a single word, that word would be ‘silence´”. 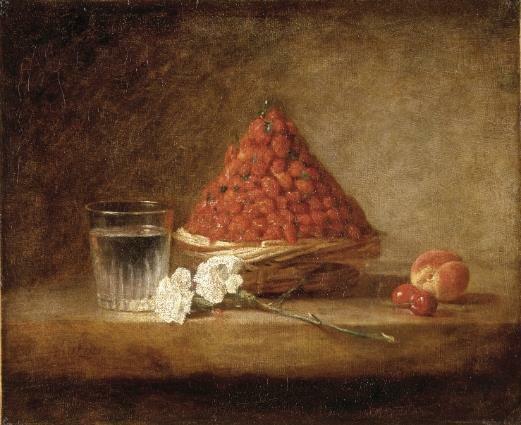 And indeed it is this palpable silence in Chardin’s still lifes that differentiate them from the work of most of the other leading painters in that genre, which had traditionally been considered a minor one and whose recognition in the 18th century favoured the development of Chardin’s highly distinctive style. Chardin enjoyed success in his own lifetime, while later artists such as Cézanne, Matisse, Picasso, Morandi and Lucien Freud considered him their master.